An incredible view of the Tuckaseegee River rushing through his front yard wasn’t quite spectacular enough for Barry Kennon. So, the champion kayaker cleared a beach and built an improvised tiki bar on the riverbank. Here, down a winding, rutted forest road just west of Sylva, the Louisiana native has carved out a little piece of heaven for himself. 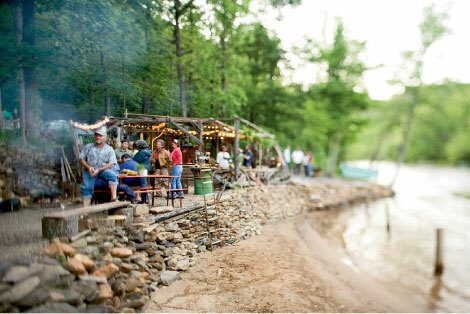 Despite the homestead’s remote locale, you’d be hard-pressed to find a person in this close-knit, Jackson County community who hasn’t paddled the Tuck, or shared a cocktail with friends at the bar during the host’s annual summer bash. Tonight, mai tais adorned with mini umbrellas aren’t on the bar list, but plenty of local brews and regional wines will flow. Kennon’s friend and former bandmate, Karl Engelmann, executive chef of Thirteen Moons restaurant at Nantahala Village, is preparing a rustic mountain-style meal with almost all the ingredients and dishes coming from local growers, bakers, dairy farms, and fisheries. As noon strikes, a handful of Kennon’s friends are concentrating on stringing lights and lanterns around the bar and chopping wood to feed the campfire that will burn late into the night. It’s a fitting clubhouse for Kennon since he spends most of his time on or near the water. In 2001, he won the World Kayaking Championships in slalom and freestyle. These days, he runs a business, Tuckshot, photographing rafters as they shoot through the rapid in his front yard and bartends at Papous Wine Shop in Sylva. As more decorations go up, including tiki totems and palm leaves, Dieter Kuhn, Sylva’s resident brewmeister and owner of Heinzelmännchen Brewery, takes the B.Y.O.B. standard to a master’s level and taps a keg of his seasonal Hoppy Gnome. The set-up crew continues their work with golden pints in hand. In the kitchen, Engelmann is crisping slices of fresh ciabatta bread and sesame-covered filone from Annie’s Naturally Bakery in the oven, which will be served with a panoply of cheeses. For the early guests, he sends out a platter of thick triangles of farmstead cheeses from Yellow Branch Pottery & Cheese, globes of Dark Cove goat cheese covered in chopped chives, and crudités. Moving on to the trout, he blends pork sausage from Nantahala Meats and Poultry in Franklin, chopped croutons, garlic, and herbs, and spoons the mixture into the whole trout before wrapping each with bright green banana leaves and tying them with string. “This will literally steam the fish, keep the moisture in, and enhance the flavors,” Engelmann says. He has another trick in mind, too. Shells from the boiled peanuts he’s serving with the Cobb salad will go into the grill flames to add a nutty flavor. When Kennon returns from a quick kayak run upstream with friend, Justin Whinery, guests are already building their own salads. The ingredients are creatively presented on a large flat stone and glasses of a refreshing riesling by Shelton Vineyard in Yadkin Valley. The host helps his friend Robert Henderson build a makeshift grill in the fire pit, where they roast the corn in the husks and cook the trout. It’s not long before the guests gathered around the picnic table get to unfurl the banana leaves and taste the juicy fish. The side dish of fluffy potato cakes seasoned with chipotle and ancho peppers packs a spicy bite and the corn is a toasty campfire classic. As serving platters are cleared from the table and bar, the DJ starts the music. The crunch of gravel under tires signals the arrival of more friends, some carrying six-packs under their arms, others with bottles of wine and liquor. Kennon is right, there is a good vibe here. As he wanders from torch to torch setting each aflame, music fills the valley and a cool wind whips in off the water. Yet for those who have dined—now finishing with creamy, orange-scented, chocolate-chip cannoli and a Caboose Cellars Blueberry dessert wine—it’s time to get back to socializing with the new bunch that has arrived at this paddler’s paradise.